Recently, our neighbor, Carrie, asked if I would produce labels for her project. And of course I said yes; but wanted to know more about her plans. To start the project, Carrie cut a block of wood into cubes using her miter saw. 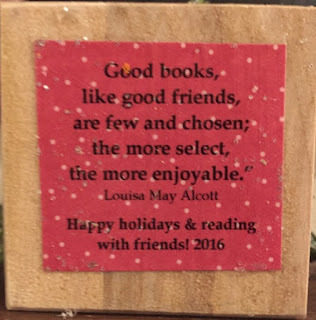 “For about $15, I got a nice 3’ x 2.5” piece of wood that enabled me to cut out 12 cubes. After cutting the wood, she sanded the wood using sandpaper to smooth out the edges. Once the blocks were finished, Carrie went online to get the images of the books. 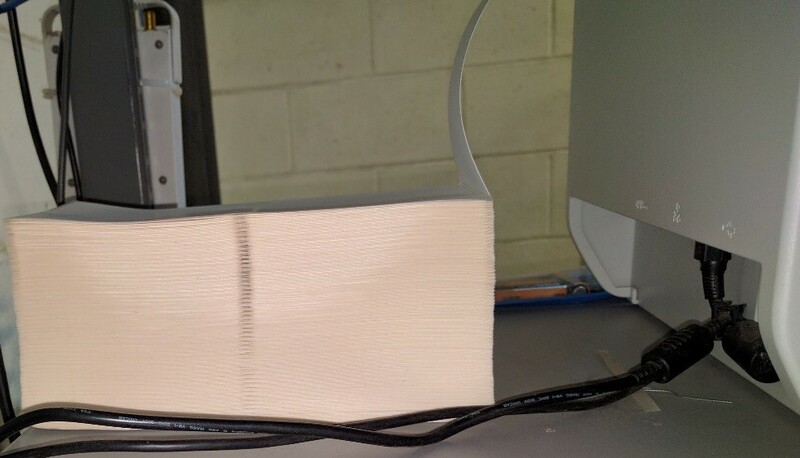 Initially, she tried to print the images on her desktop printer; but was unhappy with the results. Given she knew I was in the label business, she asked me to print labels for her. After listening to her requirements, I suggested she create a 4” x 8” PDF containing the highest resolution book cover page images she could find. I suggested 4” x 8” size as I had this size available in a glossy paper label making it easy to print. 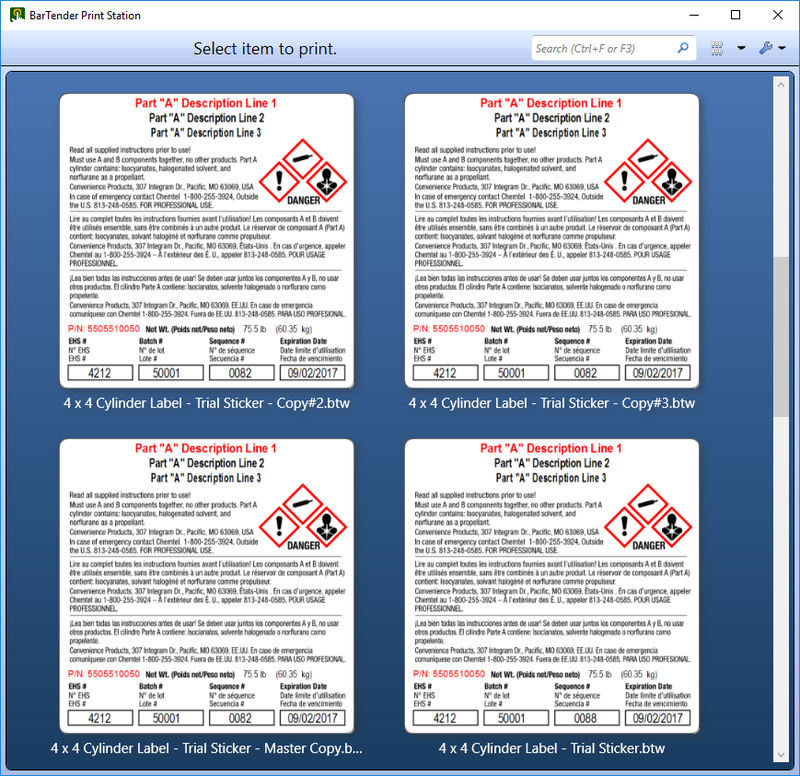 It would have been easier if we would have created individual smaller labels printing one at a time; but you would need to have the correct sized images and labels to make this work correctly. 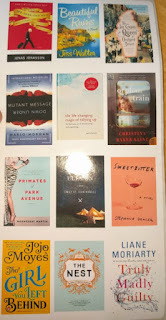 I printed 12 labels, each containing the set of images representing each of the books read during the year. Carrie then cut the individual image labels and applied them to the blocks including a special message on the bottom. Then, she coated the block with an acrylic sealer to protect and give it a shine. Finally, she drilled a small hole in the top, added gorilla glue in the hole, and forced the knot on the string holding the loop/bow into the hole. 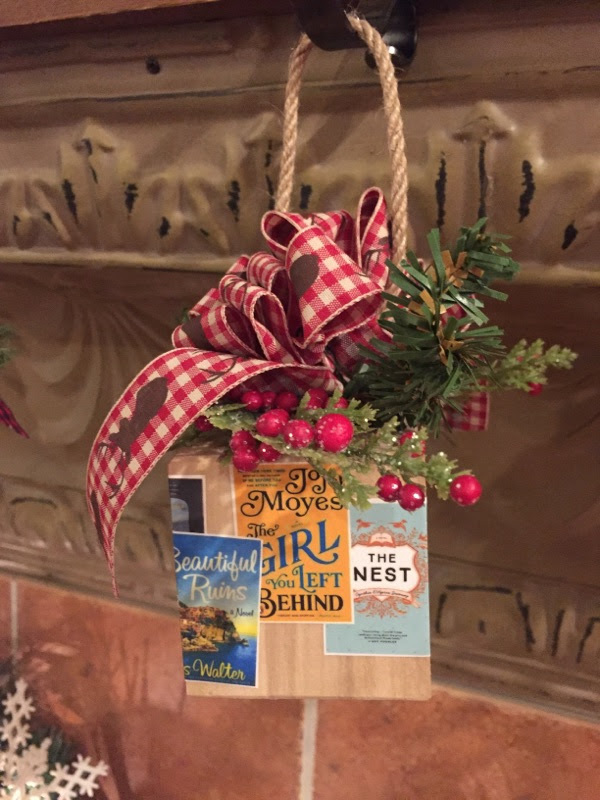 And Voila, Carrie has produced a beautiful holiday ornament for her club! 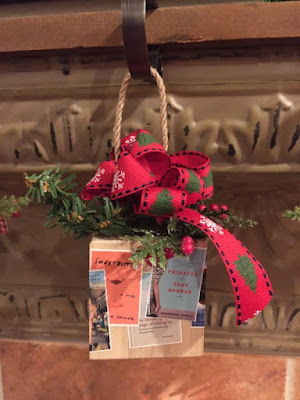 Carrie is crafty and creative; and a great neighbor. 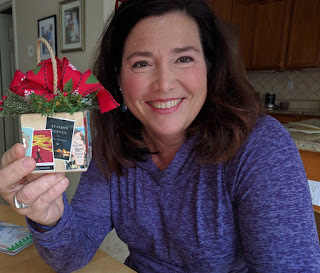 And using Carrie’s idea, you can turn the labels printers in your plant or office into your own personal handy-craft tool; a “Fun with Labels” opportunity. Contact us if we can help you with any of your label needs. Clayton Corporation (http://www.claytoncorp.com/) is a full-service manufacturer specializing in the design and development of aerosol valves and plastic components for companies around the world. Beginning with the valve created for the first aerosol whipped cream, Clayton Corporation grew as it continued to design and manufacture parts for products in the OEM food, dairy, personal care, hardware and industrial building materials industries. Global manufacturers have come to rely on Clayton as the source for innovative product dispensing solutions. Today, Clayton continues to be at the forefront of component design as new materials and products are developed, applying the spirit of quality and innovation that has been its hallmark for more than 50 years. Clayton’s Mechanical Design Engineer first contacted me in 2015 when working on their GHS label printing solution for the Industrial Building Materials division. 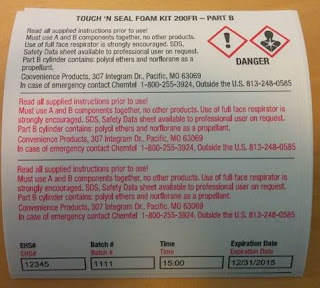 A variety of their products required unique but very similar formatted labels to supplement hazard and precautionary information pre-printed on their products. Each label was unique due to the variable data required including part number, product description, weight, EHS #, batch number, sequence number, and a dynamically calculated expiration date that needed to be placed on the labels at print-time on the production line. 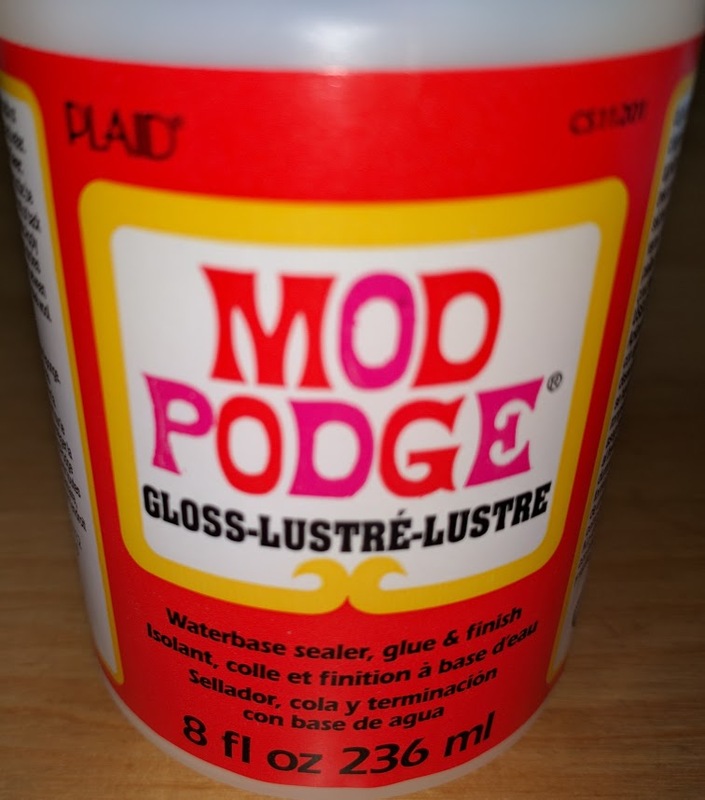 Additionally, this label would include up to three different languages – dependent on the product market. 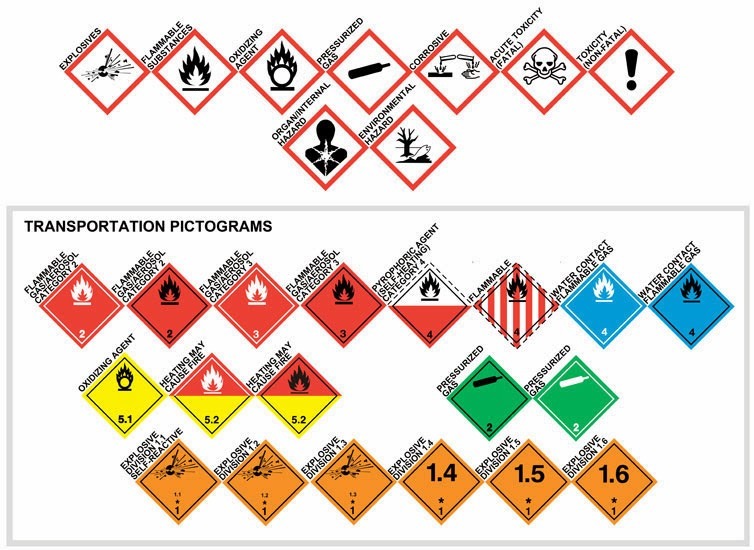 Another of Clayton’s applications, not included in this blog, was creating GHS labels for some lab chemicals and raw materials. In addition to the variable data on the label, Clayton needed to create a two-part label; a Part A (Above) and Part B (Below), at the same time. The labels were to be printed one pair at a time on their production line and applied by an operator wearing gloves. Based on our discussion, I first created a Form-Fillable PDF for Clayton using Adobe Acrobat. This type of label artwork works well when you have limited number of products and limited number of variable data fields. Although easy to do, it opens up the opportunity for operators to enter incorrect data. For these situations, we recommend a label design and printing software application. For Clayton, we recommended BarTender® from Seagull Scientific (www.seagullscientific.com). Clayton operation managers wanted an easy, nearly fool-proof, method of selecting and initiating the correct product label print operation with minimal operator intervention. 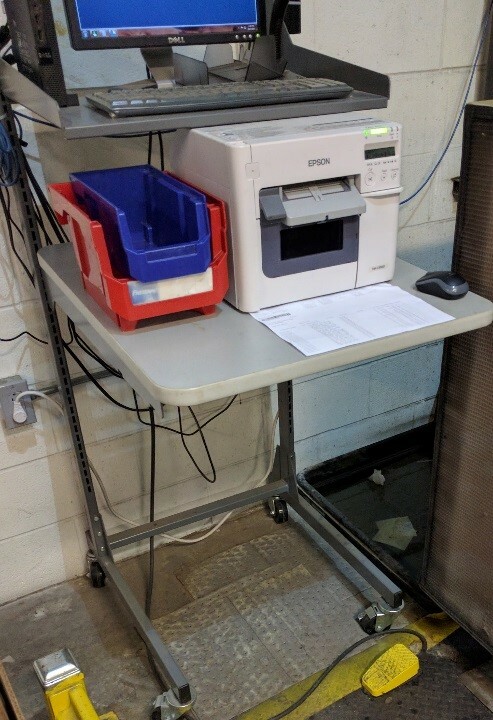 To this end, Clayton’s Systems Analyst/Programmer incorporated a bar code on the work order and developed a BarTender data entry form to accept a scanned barcode. From this scan, an Excel database is accessed to retrieve the static product data to fill in the variable label data and to drive the template selection in regard to languages, colors, and whether label parts A or B, or both should be printed. Lastly, they needed to print the labels on demand as the product passes thru the work center. As they did not want any additional operator intervention with the keyboard or desk mouse, Clayton incorporated a foot-controlled switch or foot mouse. 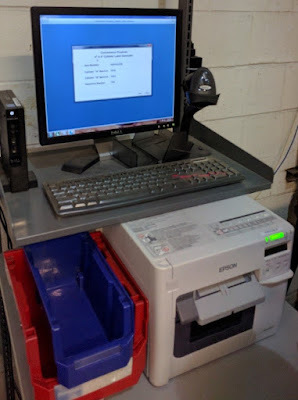 The operator simply presses the foot mouse when a new label is needed and it’s delivered in a few seconds. Data Entry Form displayed. See barcode scanner (right of monitor). 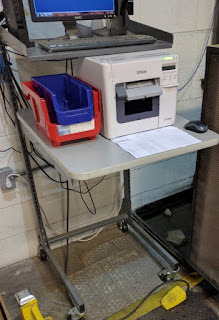 Additionally, Clayton is using BarTender Print Station to manage and print their GHS labels. One other key part of the solution was label design. To make it easier to recognize the two different part labels, Clayton color-coded the description and part number on each label. Part A in red, and Part B in blue proved to be a simple, but highly effective means to facilitate accurate label application. To make this solution even better, Clayton decided to use 1000-piece stacks of fanfold labels with easy release backing. 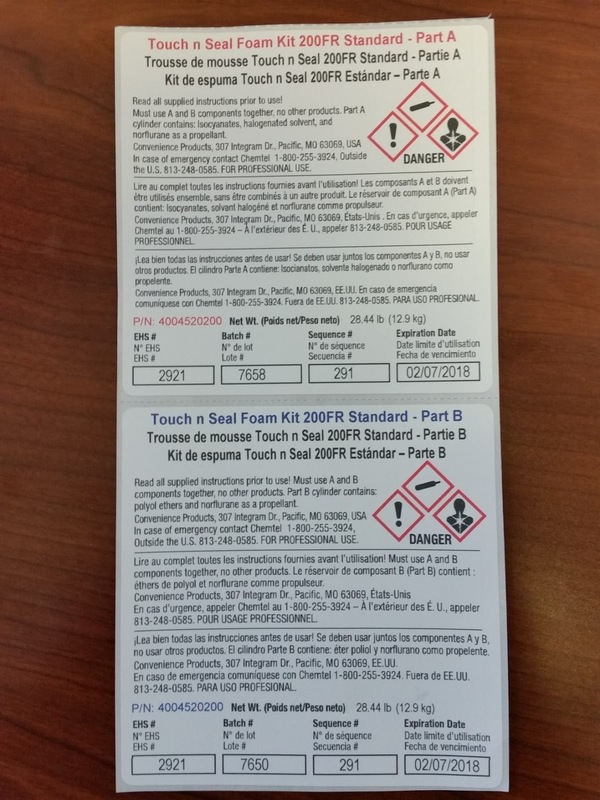 Clayton wanted a way to print and apply by hand the two part label that would be easy for an operator wearing gloves. 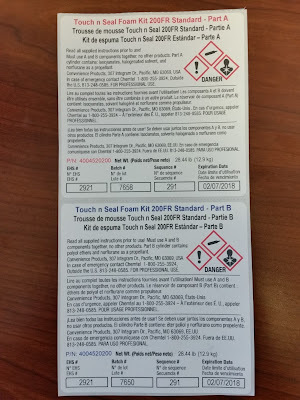 The issues with using rolls of labels were both the lower quantity of labels per roll, and the curl made them more difficult to remove the backing, especially while wearing gloves. With two 4” x 4” labels per fold, the two-part label prints and dispenses just as needed. Currently each of their C3500 machines prints in excess of 500 labels per day. “One of Color Label Solutions’ areas of expertise is GHS — they understand how the technology pieces fit together to build easy-to-use and reliable labeling compliance systems for companies like Clayton,” said Elizabeth Sinclair, Verticals Marketing Manager at Seagull Scientific. Clayton has built a great GHS label printing solution for their company using color label printers, environment resistant labels, chemical resistant ink, and software components supplied by our company. 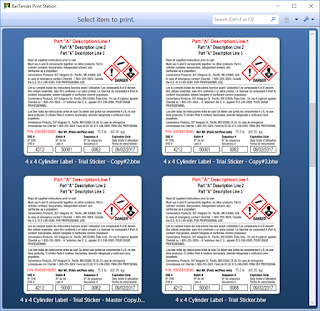 I’m glad we were able to be of assistance in the creation of this elegant and simple way to print complex GHS labels. Be sure to contact us if you need to make a complex label system simpler.